Here at Crossroads Trade we get to see people at play. Parents and children sit on the floor and pop open one of our matrioshkas or nesting dolls. Adoptive parents identify the clothing on a Guatemalan doll as from their child's district. Doll collectors stop by to see the latest arrivals from Colombia, Jordan, and Uzbekistan. Our dolls come from all over the world: Some are chiefly for collection and display,like our South African Ndebele dolls in their symbolic garments. Others, like our dolls from Guatemala and Gaza, are very huggable. All teach about their cultures and for the doll makers, such as the Karen tribeswomen in refugee camps on the Thai/Burma border, they're an important source of income and ultimately, dignity. Our matrioshkas come from fair-trade suppliers who import from Russia. The nesting dolls range in size from the length of a fingernail to a foot tall. The number of nesting dolls in a set can range from a total of three to 15. The themes are endless -- jolly grandmothers, girls with geese, Father Frost and winter fun, Bible stories and the Jewish rites of passage. People of all ages marvel at our simple, ingenious, swinging ball, wood toys. Most come from the Russian village of Bogorodskoye. Chickens peck, tails wag, knitters knit. In a contemporary twist, fingers clack on keyboards. 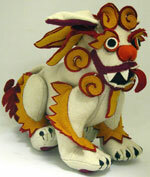 We've recently added to our whimsical collection of puppets. 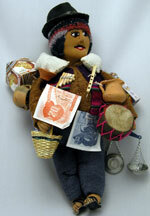 Our ecologically produced puppet-to-wear was the winner in a national toy contest in Bolivia. Its manufacture provided employment to more than 100 artisans. Our new snow lion and tiger puppets, featuring most excellent tails, are made by a project employing Tibetan nomads in Lhasa. 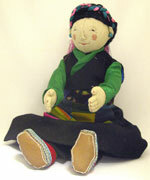 Our folk toy collection changes all the time; visit these pages often to see what's new. 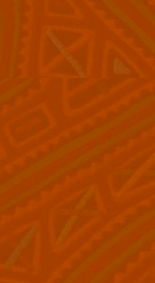 Your purchase will provide fair wage employment to an artisan, and delight the recipient.